This is one of those fun routines where you could have a wager with a friend that they can't perform a particular shot and then prove that you can! 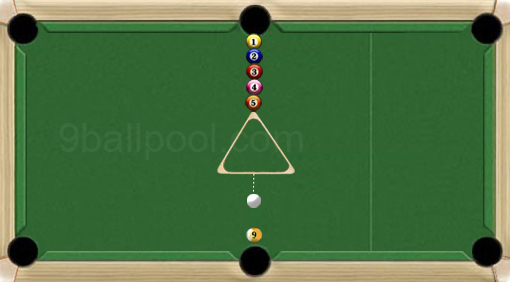 You need to simply place balls 1-5 as shown in the graphic above with all the balls lined up directly in front of the side pocket. Then position the 9 ball over the opposite side pocket. Next simply ask your friend if he can pot all six balls in one shot. It's pretty much for sure that they will not be able to do this so you offer to bet them that you can.